What is widely viewed as the best and most viable delivery of health care in America? 1. Home care is delivered, as you would expect, at home. Dorothy said it best: “There’s no place like home.” Certainly, this is a statement that most people would wholeheartedly agree with. There is nothing like the comfort and familiarity of being cared for in the comfort and familiarity of one’s own home. 2. Home care helps keep families together. Compare this to taking an elderly person away from their loved ones. At no time is family more important than during times of illness. 3. Home care helps seniors maintain their independence. Home care allows seniors to continue to live in the place they function best – their home. 4. Home care prevents or puts off institutional life. Living in a long-term care facility is unfamiliar and can often be intimidating. Most people prefer postponing the inevitable as long as possible. 5. Home care helps promote healing. Medical evidence shows that people recover more quickly at home. 6. Home care is safer. There is no secret that people pick up infections and other complications when they live amid a chronically ill population (such as in a hospital or long-term care facility). This is obviously not the case when cared for at home. 7. Home care means personalized care. Care becomes a one-to-one proposition in the home. You get this nowhere else. 8. Home care often gets the entire family involved in providing care. Immediate and extended family members often take an active role at different times of the day. 9. Home care reduces the stress that often accompanies illness. Illness increases anxiety and stress, but it’s not nearly as great when care is practiced in the home. 10. Home care is the most effective form of health care delivered in terms of customer satisfaction. It all comes back to the fact that people prefer to be at home. 11. Home care is delivered by a special group of people. People don’t work in the home care industry for the money. They do it for the emotional satisfaction of helping others and for making a difference in the life of another. 12. Home care extends life. Studies by nursing schools and government agencies have found that home care extends life. 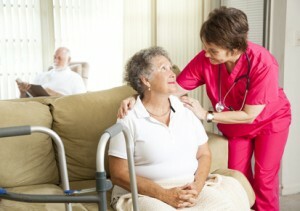 Visits by home care personnel often provide spiritual as well as medical support. 13. Home care improves one’s quality of life. For most people, the quality of their life is far better at home than anywhere else. 14. Home care is less expensive than other forms of care. The cost of home care is always less expensive than hospitalization and almost always more affordable than nursing home or assisted living care. 15. Technology will make home care even more desirable in the future. Medical and technological advances will soon make it possible to diagnose, monitor and treat illness at a distance. This will help make home care even more of a preferred option.